Sector equity fund can provide an alternative for investor to invest in certain attractive stock or equity market. The following health sector can provide growth and value for you. One of these best sector equity funds is described below. 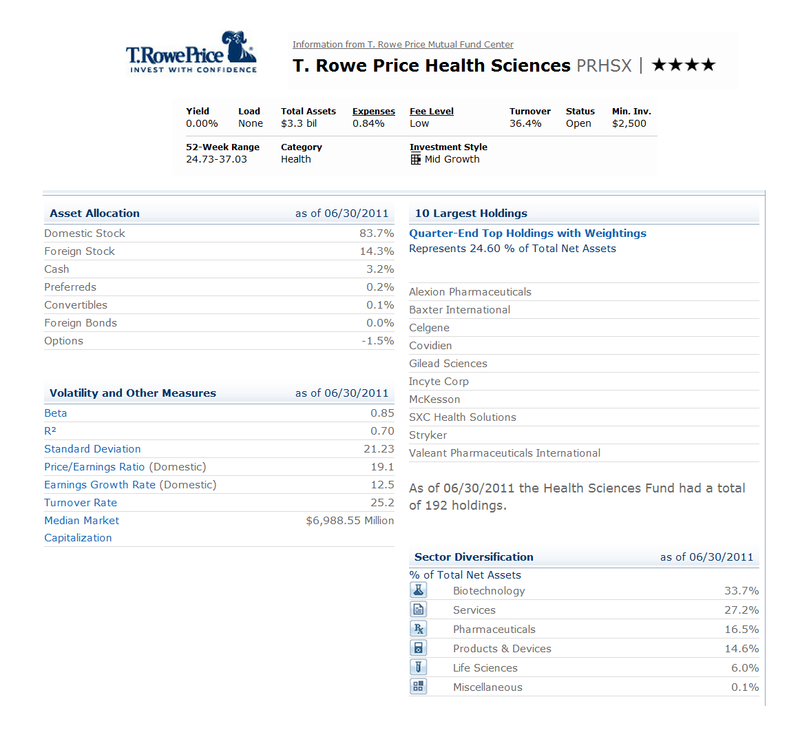 The T. Rowe Price Health Sciences fund objective is to provide long-term capital appreciation. The fund generally invests most of assets (>80%) in the common stocks of companies engaged in the research, development, production, or distribution of products or services related to health care, medicine, or the life sciences. While it can invest in companies of any size (i.e. large cap, mid cap, small cap), this TRP fund invests the majority of assets in large- and mid-capitalization companies. Kris H. Jenner has managed this fund since January 2000. He is the Chairman of Investment Advisory Committee. This T Rowe Price fund was incepted on December 1995. This fund has 0.84% expense ratio per year. Its total net assets are $3.28 billion.There is no yield of this fund currently. The minimum balance to invest in this TRP fund is $2,500 for brokerage account and $1,000 for IRA account. This top rated fund can be purchased from 85 brokerages, such as JP Morgan, T. Rowe Price, Scottrade TF, Vanguard, TD Ameritrade Inc, DATALynx, Pershing Fund Center, Schwab Retail, E Trade Financial, Royal Alliance, Firstrade, etc. Currently PRHSX has gotten 4-stars rating from Morningstar. This best rated fund is currently open to new retail investors and to subsequent retail investments. This T Rowe Price fund has returned 44.27% over the past one year, 11.27% over the past five years and 8.56% over the past ten years. The best performance of this fund was achieved in 2000 with total 1-year return of 52.19% and the worst was in 2008 with -28.77%. The 5-year average return of this world stock fund is 11.27%. It has 12 years with positive performance and 3 years with negative return. 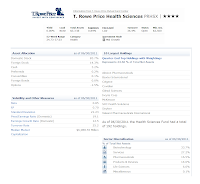 This Health Sciences sector fund had a total of 192 holdings as of June 2011. The top 10 holdings represent 24.60% of total net assets. They are Alexion Pharmaceuticals, Baxter International, Celgene, Covidien, Gilead Sciences, Incyte Corp, McKesson, SXC Health Solutions, Stryker and Valeant Pharmaceuticals International. The top sector diversifications are Biotechnology (33.7%), Services (27.2%), Pharmaceuticals (16.5%), Products & Devices (14.6%), Life Sciences (6.0%) and Miscellaneous (0.1%).